Mammadaba - Go on a hike with enthusiastic natural scientists in LVM Nature Park in Tērvete! Inspired by spring, the environmental education specialists of LVM Nature Park in Tērvete together with professional natural scientists and specialists are organising special educational lessons. Nature Park in Tērvete has a lot to be discovered, taught and observed! Already on March 30, on Saturday, an educationally rich and active up to two hour long hike will take place at the Nature Park in Tērvete. Together we will discover the early spring in forest! We will try to notice “footprints” of animal presence in a forest, identify their houses, “canteens”, “baths” and “highways”. Go on an exciting hike together with zoologist, expert of the Nature Conservation Agency, enthusiastic nature explorer and observer – Vilnis Skuja Gathering will be at the Information Centre of LVM Nature Park in Tērvete at 12:45 noon. Participants are advised to think about comfortable clothes and shoes, we will step off of the park’s trails, into the virgin forest. 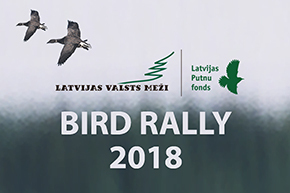 On April 6, also on Saturday, environmental education specialists of LVM Nature Park in Tērvete together with D. Boiko, the ornithologist of Latvian Museum of Natural History, swan researcher, invites all to go on an evening hike “Visiting birds of lake”. Meeting at the Information Centre of LVM Nature Park in Tērvete at 5 PM, event will be three hours long. At the Tērvete Reservoir a particular activity can be observed in late afternoons, when it is slowly getting dark. The water of reservoir is rippling and flickering, it is very popular for the migrating bird flocks, geese and swans, also ducks and other. Participants are advised to think about comfortable shoes and warm clothes, it is advised to bring a binoculars. We invite families with school age children, nature friends and hiking enthusiasts. Participation in the educational hikes is with the entrance tickets of LVM Nature Park in Tērvete. More information by calling +371 63726212 or +371 28309394. The LVM Nature Park in Tērvete grows year after year, surprises its visitors and encourages young and old nature friends to learn about forest! Go into nature, relax in forest!